The majestic peaks of the Monch, Schreckhorn, and Eiger provided an imposing backdrop to miles of impossibly picture-perfect landscape. A landscape of beautiful streets winding downhill, of quaint cottages in the distance with brightly colored flower beds, of sweeping alpine forests on mountain-sides that disappeared into the clouds and of the snow-clad peak of Eiger that mightily burst forth from the top of the clouds. The gurgling of a nearby stream and the chimes from the village church added to the feeling of having been transported to a fantasy land from another time. Earlier in the day, we flew into Switzerland on a bright, sunny morning. The weather Gods had been kind so far to us on this vacation. We enjoyed completely dry and rain-free days in England which has seen some of the most severe rains lately and here we had a bright, sunny day with excellent visibility..
On our first day in Grindelwald, we strolled down to the delightful Oncle Tom’s Hutte, for freshly made thin-crust pizzas. I remember ordering one with tomato sauce, mozzarella cheese, broccoli, bell peppers and mushrooms, and the other with tomato sauce, mozzarella cheese, smoked salmon, leeks, and sour cream. Both were delicious, and the glasses of Prosecco di Valdobbiadene (a type of sparkling wine) nicely complimented our lunch. Another place I recommend is a small family-owned restaurant called the Riggenberg Tea-Room. 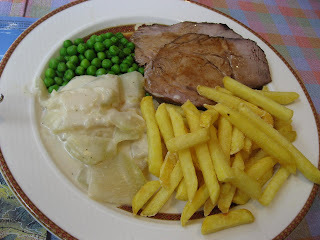 The special consisting of grilled pork meat, fries and buttered peas was delicious, as were their freshly made ice-cream desserts. We did try the cheese fondue during our last evening here; the fondue was served with lots of bread chunks, potatoes in their skin, and shallots. The dish was interesting but not particularly great. On other days, we lazed around in our little wooden dwelling, made our own breakfast and dinner, and felt like we could be here forever without feeling home-sick. The local breads, wine and cheese were great, and in this setting tasted better than any gourmet fare I have had! There is a cableway from Grindelwald to a place called First (altitude 2100 m). From the summit station on First, you have a choice of high-Alpine hikes. The easiest one is the 50 min hike to Lake Bachalpsee, one of the most beautiful mountain lakes in the Alps. As well as admiring the stunning views of the mountain world reflected in its crystal-clear waters, visitors can also try out their angling skills here. 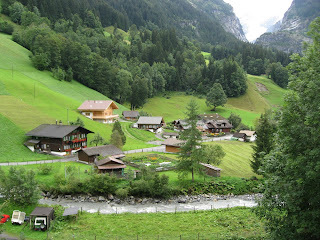 Switzerland is a treat for nature-lovers. Everywhere will notice the effort that has been taken to promote tourism in a manner that is friendly to the environment. 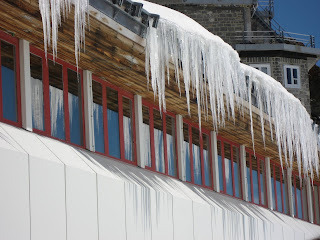 Nowhere more than on the rail journey to the ‘Top of Europe’, Jungfraujoch. The trip takes you via Kleine Scheidegg and through the Eiger North Wall up to the scenic splendors of the Jungfraujoch in the heart of a wonderland of glaciers and eternal ice. Attractions include the Ice Palace, the Sphinx observatory building overlooking the Aletsch Glacier, husky-driven sledge rides and the Snow Disk Run. This is a popular site for skiers, hikers, and trekkers. The scenic splendor as the train climbs the steep incline is extraordinary. The day was clear and sunny and we could see distant villages, gondolas (as the cable-cars are called) slowing ascending the peaks, tiny figures of trekkers in distant mountain trails, and vast, lush green valleys and hillsides speckled with colorful flowers and cows everywhere. The Jungfrau railway was built in 1894 by a charismatic man with big dreams called Adolf Guyer-Zeller. The rail system took 16 years to complete, and right from inception was electricity-driven, even though electric-trains were still in their infancy. 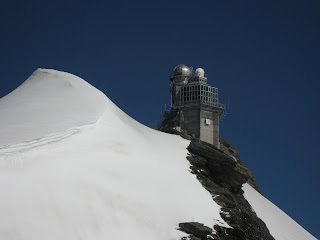 Jungfraujoch has the world’s highest post-office, a high altitude weather station, and an advanced research station to measure data on pollution, cosmic rays, and ozone depletion. 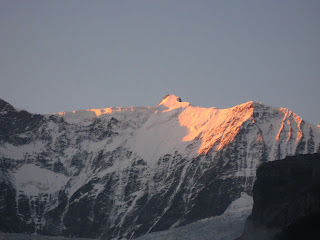 But most interesting of all, it is also home to Bollywood Café, probably the highest Indian food restaurant in the world! Decorated with film reels, movie posters of Hindi and Tamil hits, the restaurant offers an Indian buffet lunch for CHF26 pax. While they have few items in the buffet and no Indian breads, the food was pretty good, especially the Turkey curry, the Chole, and the Alu-Gobi-Corn subzi. I also noticed Hindi signs (in addition to the usual ones in local languages and English) at cafes in Jungfrau advertising chicken and veggie snacks! Figure out if renting a car is a good option for you. A car will give you the flexibility of stopping and admiring the splendid views as you travel. Americans will not have trouble since you are driving on the ‘right side of the road’. Indians drive on both sides of the road in India, so we can drive anywhere! 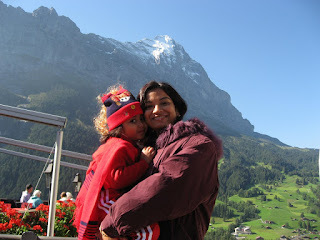 We traveled in Switzerland by rail instead of renting a car. While every visitor hears about the Swiss Rail Pass, please contact the Info Desk in the Airport Railway Station first; given your travel plans they will recommend the most cost-effective Pass for you. For us they recommended a Half-Price Rail Pass. There are lots of vegetarian food options in Switzerland. The long-distance trains have a café on-board too. If you are staying for over a week and plan to buy groceries and stuff for the kitchen, find out where the nearest Coop store is. They are a nation-wide grocery chain and you will find better prices. Beautiful pictures! When were you there? It looks like winter. The light brown cottage in the first picture is simply gorgeous. I can't begin to tell how much envious I am of your globe trotting! 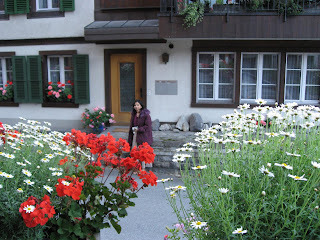 @vishal: I love these chalets/cottages too. That one is light brown because it's new; one winter of snow and I guess it will turn a little darker. Hey, that Riggenberg Pork et al looks completely awesome. It is just 9.30 am & one is already drooling - and I am the no-breakfast type! Keep these posts coming. Wow, lovely pictures, great post. New spiffy banner on your blog too. Am definitely looking forward to your next one. What a lovely guided tour through Swish beauty of nature. Even from Norway and loving skiing and winter sports I must admit I haven't been there yet. You just have to visit and report from Norway one day - a very similar nature - check my wifes guest post - an American finding The Spirit of the Norwegian Soul. @rennyba: Yes, have to do Norway some time too; your blog has been an inspiration for a visit to that part of the world some day. Can I request you somthing. We would like to view more pictures. 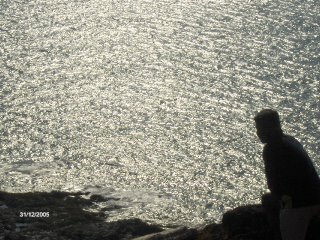 If you could use Picasa WebAlbum, we too can share the photos. @harekrishnaji: I was planning to do just that! 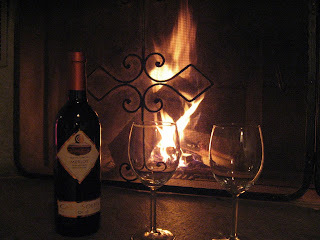 @jaya: Welcome to my blog! There's always something about settlements in valleys, nudging the base of hills and mountains, isn't there? Beautiful photos and great write up. The photo of the view from your terrace reminded me so much of Vermont (where mt wife and I live). I've seen a half a dozen places that look like this (more or less). @laura: Oh Yes, and the reality is even better than the pics! Did u get to dine at the Bollywood Hotel ( think that is what my Fren told me it is called ) ? Grindelwad --> name reminds me of The deathly hallows ! .. Nice to know u had a whale of a time.. Europe continues to remain the must see in every one's list and the reasons are obvious! 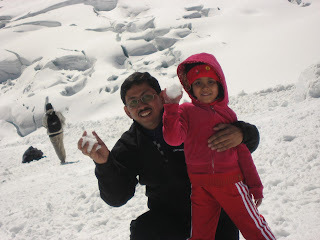 @jitesh: Maybe there particular times during the year when you find more Indian tourists. Re: my blog, like they say in Hindi, "tumhare muh mein ghee-shakkar"! We found your data on grindelwald to be very accurate. We tried both Oncle toms hutte and the Riggenberg Tea-Room. Both were very good. Now this small city will replace my current fav of wildflower hall /Oberoi. @Anon/puneri bong: Glad to see this blog was of help during your vacation! I have been meaning to visit Willflower Hall for a while now; however, the place doesn't seem kid-friendly and I have an eight-year old. @Gautam: You know, I can't recollect right now. Let me see if I can hunt it out for you. Thanks for your comments.